I’ve worked with teammates who would crow about they were email MASTERS! Cawing about how they send 100’s of emails each day! Maybe you’ve had to work with someone like this. The Hollow Crow reminds us that productivity isn’t about getting the right number of things done, but getting the right things done. Period. Without a focus on effectiveness above efficiency we can become masters at sending worthless emails, and not giving our priority work the deep concentration it needs. 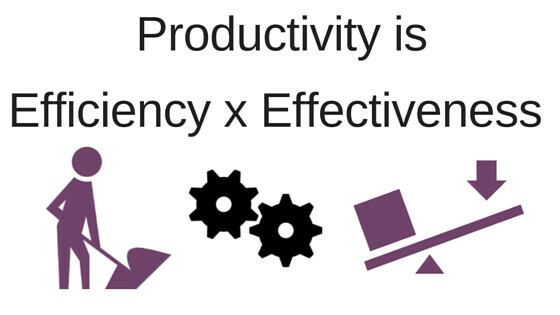 Being efficient only amplifies our productivity when we are doing the right things. The Effective Executive is densely written, but relatively short book of 208 pages. Drucker offers a trove of simple and strongs truth about how we as knowledge workers need to focus on our key 1 or 2 priorities to avoid getting pulled into daily fads or fire fighting. This is a good example of the contrast between the effectiveness and efficiency. Is this still worth doing vs. how can I do this faster? It’s the difference between a frozen prepackaged meal and a thoughtful meal plan that promotes your health into your 100’s. Drucker makes the point in the book that an effective executive can not focus on 3, 4, or 5 five priorities at time. Just 1 or 2. So when you think about your work can you summarize your focus as just two priorities? When you think about the leader you are in your family can you state just two priorities? Thanks for the book review. Sounds like an excellent book! Be Well! | Own Finances! | Unleash Talent! | Deliver Flavor! | Love Patients!